– The band seemed genuinely grateful for their fans. They also didn’t hype up their own live show (listen up, Foo Fighters). – A real effort was made by the band to connect with the large audience and to make sure everyone was having a good time. It’s the little things that make often make the biggest difference in a live show. – Chris Martin’s live vocals were actually better than they were on the band’s 2003 concert DVD. – Too bad they didn’t play Yes. – All the band members have been practicing. The drumming on the new songs is miles better than it is on their old albums. – Best sound mix I’ve ever heard in MTS Centre. Perfect volume and each member’s instrument could be heard clearly. Hats off to the sound crew. – Turns out Fix You is actually a good song. Funny how some songs just need to be played live before they click for me. 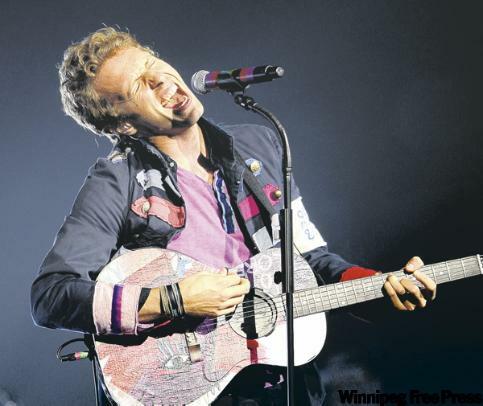 Still not crazy about the song Viva la Vida, though it is much better live than it is on CD. – Chris Martin doesn’t take himself too seriously. I like that. – I was happy to see that the band mostly played songs from A Rush of Blood to the Head and Viva la Vida. Those are easily their best albums (actually, the Viva la Vida album alone is better than their previous three records combined). – Homemade band outfits are cool. – Overpriced merch is not. My brother brought $30 for a t-shirt but went home empty-handed. – Glass of Water rocks. If you don’t have the Prospekt’s March EP already, what’s taking you so long? – My $65 seat was just as good as my brother’s $95 seat. – Excellent video work on the big screens. It looked pro and wasn’t too distracting or flashy (although I still spent most of the time watching the stage). – Will Champion should sing lead more often. – Thanks for the free CD guys! Overall, it was an excellent show. Five stars out of five in my books. I would certainly see them again. Really solid musicianship all around. Hats off to Coldplay, they’re much better than their critics think. Here’s the night’s set list, in order this time. The highlight of the night for me was the back-to-back trio of Glass of Water, Cemeteries of London and 42. How the heck did you remember the setlist?